The study finds that humans — Earth’s 7.6 billion people are just 0.01 percent of Earth’s biomass — have since emerging on Earth wiped out 83 percent of wild animals and 50 percent of wild plants. Humans have destroyed 80 percent of marine mammals and 15 percent of fish. Livestock are now 60 percent of mammal life on the planet, humans are 36 percent, and wild mammals are just 4 percent. Seventy percent of birds now on Earth are farmed poultry. Just 30 percent are wild birds. Bones of the domestic chicken (once a wild bird) litter the planet and scientists say: “Over the past 70 years, the bird has become a global staple, and could be the key fossil evidence for human-influenced epoch.” The chicken was first domesticated 7,000 to 10,000 years ago by taking the Red Jungle Fowl, Gallus gallus, from Southeast Asia. Poor flyers, they were easy to catch. By the 1950s, birds that had been used primarily for eggs had been pumped full of antibiotics and Vitamin D so they did not need sunlight and open air — to shorten 18 weeks to six weeks to go to the slaughterhouse. 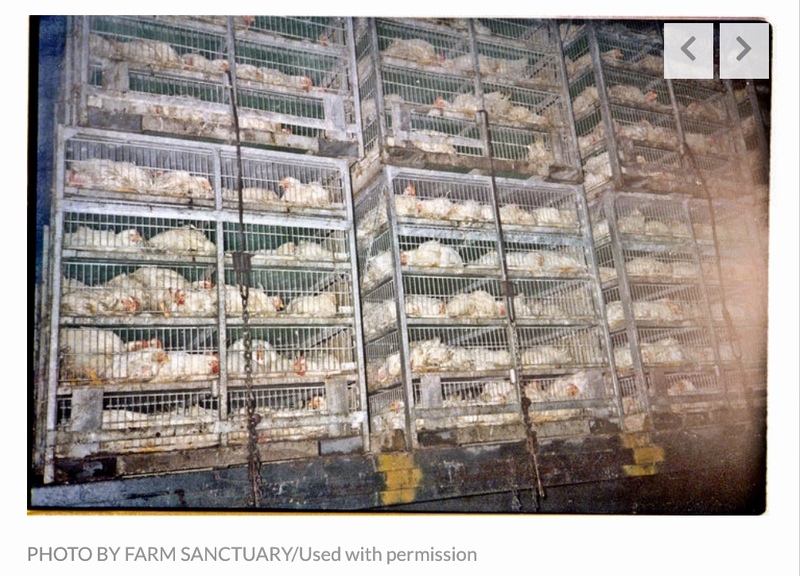 Seventy-five percent of chickens come from factory farms. It is predicted that, by weight, by 2020 chickens will overtake the most-eaten animal on the planet: pigs. 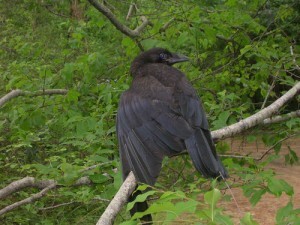 Intensive bird production fouls the environment and birds suffer greatly for pillows, coats and feather quilts. Over 7 million pounds of waste are created by animal agriculture every minute. Watch Trader Joe’s egg production exposed on this YouTube. Almost 60 billion chicken are hung, their throats cut, and bled out every year. On May 30, 2018, Amy Goodman on “Democracy Now!” aired a segment on the May 29 Direct Action Everywhere march by hundreds of people to a Sunrise Farms chicken factory farm in Petaluma, California, which provides supposedly cage-free eggs (not) to Amazon and Whole Foods. Police arrested 39 for trespassing. Goodman talks with Pulitzer-Prize winning journalist Glenn Greenwald about how animal activists have been treated as “a fringe boutique group” but how closely their activism is related to the health of people, animals and planet. They discuss the political power of Big Ag and the horrific living stadards, lying producers, and lack of protection for farm animals and consumers. Professor Ron Milo at the Weizmann Institute of Science in Israel, who led the study of Earth’s biomass, is quoted in The Guardian article as saying, “But our impact on the natural world remains immense, particularly in what we choose to eat: ‘Our dietary choices have a vast effect on the habitats of animals, plants and other organisms. Milo takes the usual meat-eater approach that the only alternative to eating carcasses is tofu. The public has been duped by Big Ag into unhealthy, meat-centered consumption that involves animal suffering. Now it is known that processed meats (yes, like the brats at Brat Fest) contain carcinogens and double the risk of heart disease, cancer and diabetes as well as being linked to earlier death. Humans exploit the vulnerable. Our lack of compassion is likely our fatal flaw as a species experiment on Earth. Climate change is accelerating and we are slow to act to save the biosphere. It is co-annihilation. Let’s create a world without factory farming. Let’s create a world where the government protects the 4 percent of wild mammals Earth has left. One Green Planet offers daily recipes and animal stories when people sign up for its mailing list. An amazing variety of recipes are on its website. Montana in February decided against opening a trophy hunt, and Idaho, home to the smallest number of grizzlies, this month approved a fall hunt of a single male bear. A Wyoming wildlife commission voted unanimously May 30 to approve the state’s first grizzly bear hunt in more than 40 years, to kill as many as 22 bears just one year after Yellowstone-area grizzlies were removed from the endangered species list. This column was originally published in the Madison CapTimes on June 3, 2018.